If you were making the movie version of Walter Sickert’s life, you’d have your choice of evocative opening scenes. You could begin with the tugboat moored in Saugus where he lived in his youngest years, before it was struck by lightning in a storm and burned down. Or move to the years immediately afterward, in the family’s “old, dilapidated farmhouse” (as he remembers it), where he’d explore the creepy attic and find old portraits of Jesus while making sure not to fall through the holes in the broken floorboards. In a sense this backstory is already embedded in his music, as performed with his group, the Army of Broken Toys. But when they play the Sinclair in Cambridge on Saturday, on a bill with the Devil’s Twins and opener the Julie Rhodes Band, only one particular side of the group will be on display. For Walter Sickert and the Army of Broken Toys contain multitudes. His sprawling eight-piece band incorporates a host of influences, and descriptions of its style tend to include fistfuls of hyphens. It incorporates at least two 19th-century aesthetics: Gothic and steampunk. There’s an element of Weimar-era cabaret in the band’s shows, which may include guest interpretive dancers or performance artists mimicking life-size marionettes. There’s some punk burlesque. Arty, circus rock. One might borrow Mary Shelley’s thesaurus and go on, indefinitely. As you dig further into the group’s sprawling discography, its sound grows more familiar but harder to distill. 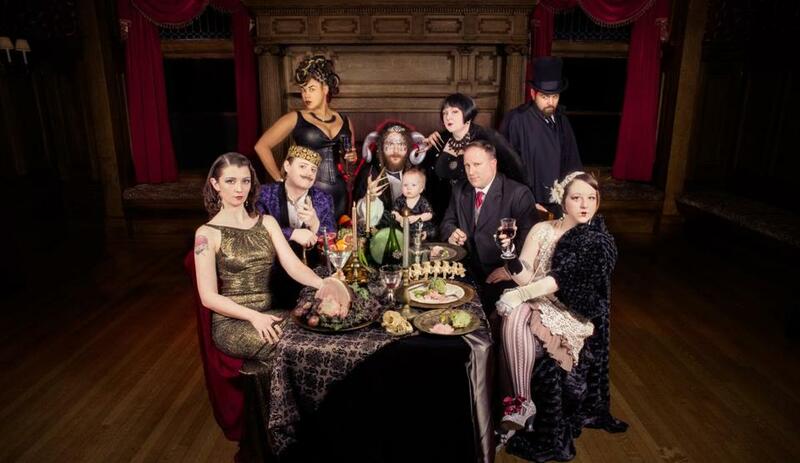 There are three releases Sickert and company refer to as their studio albums (most recently “Come Black Magic,” released last year), but these are augmented by several film scores and at least 10 full-length releases recorded as part of the RPM Challenge, a movement started by the Portsmouth, N.H., alt-weekly The Wire that encourages artists to record full albums during the month of February. Sickert began making music with musician-artist-activist Sarah Edrie (who performs simply as Edrie) in 2006 after their romantic partners ran off together, taking Edrie’s car with them. Their first work, written and recorded in that cold barn, was born from the pain of that experience. Sickert and Edrie, who became a couple themselves and welcomed their first child in 2015, worked with a procession of Boston-area art-music types before jojo Lazar (poetry/ukulele/flute) and Rachel Jayson (viola) became full-time band members. In addition to those two, Sickert (lead vocals/guitar/piano) and Edrie (accordion/toys), the group now includes Matt Zappa (drums), Mike Leggio (acoustic bass), Mary Widow (mandolin/vocals), and guitarist Brother Bones. Sickert is also a visual artist and illustrator, and the Army of Broken Toys is very much an interdisciplinary project. The group collaborated with Company One Theatre for the musical “Shockheaded Peter” two years ago and has performed live scores for silent films including “The Cabinet of Dr. Caligari” and “Metropolis.” Earlier this year the group created and performed a set of music at the Museum of Science’s Charles Hayden Planetarium, synched to animation based on Sickert’s artwork. (It’s preparing a second program to be performed on Oct. 26.) Last year the group premiered a show called “Something Strange,” inspired by Tim Burton’s “The Nightmare Before Christmas,” which will be reprised at Oberon this fall. An October concert at the Lawn on D will feature fire dancers. “There were people in bunny costumes, people dancing around, broken dolls everywhere,” Jayson recalls of the first time she saw Sickert and Edrie perform. “And I thought: What is happening? I need to be involved in more art like this.” That open sense of participation carries through to the band’s current efforts. If Sickert’s aesthetic seems gloomy, he’s in fact very funny and upbeat, and jokingly calls his group the “Gong Show” of bands. Jeremy D. Goodwin can be reached at jeremy@jeremydgoodwin.com. Follow him on Twitter @jeremydgoodwin.